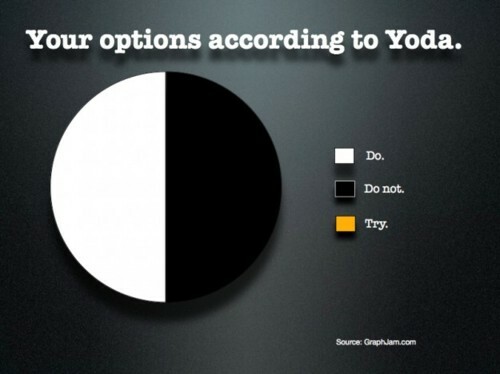 Yoda was wrong. That might seem an odd way to start this blog post, but that phrase has been haunting me ever since I heard spoken word poet Shane Koyczan use it in one of his poems. I know that legions of Star Wars fans may now be deeply offended, but it's true, you see. Yoda was wrong. When Yoda said "Do or do not, there is no try" he was terribly, terribly wrong, because life is not about the doing or doing not. Life is all about the try. There are those who think of life in terms of success and failure, I guess. Those who see it as a "do or not" world, the kind where trying is not enough. And yet what they do not seem to realize is that if you are so focused on success or failure then you may simply decide to not try at all, because it is risky. Because you might not succeed. Because there are those who think there is no value in the try, and only find value in success. But life isn't like that. We all have successes, and we all, on occasion, fail to reach our goal. But true value isn't in the success - it's in the fact that we chose to try. Recently in this community we have seen some stellar examples of people I would call heroes. There is young Christina Traverse, who at the tender age of 23 tackled the Yukon Quest, the most arduous dog sled race one can attempt. Christina, as many know, did not make it to the finish line, and due to illness and exhaustion had to be rescued from her quest (and she is still recovering even now). Her compatriot from Fort McMurray in the same race had to pull out too, in his case due to the health of his dogs. Randy Mackenzie had to give up his quest, too, and so both our local mushers were forced to give up on the race, and their dream - at least for this year. The funny thing is that I don't see them as any less heroic or inspiring because of it. I see rather the opposite, as they chose to do something so challenging and so difficult that few will ever accomplish it. Was the only value of what they did in their success? I don't think so. A community followed them on every step of the way, cheering them on, hoping for their success but more importantly hoping for their well-being.The community, those of us behind them, did not see it as a do or do not - we saw it as a try, and one worthy of our admiration. Yesterday local resident and politician Phil Meagher attempted a ski trip from Fort Chipewyan to Fort McMurray to raise money for the Centre of Hope. It was a bold and audacious plan, to ski non-stop all night, over 200 km, most of it alone. And Phil came very close to making it, too, but when he developed difficulty breathing he had to stop, and he had to call for help. I suspect he may feel he failed somehow, or let others down, and yet I think nothing could be further from the truth. The reality is that people were astonished that he would attempt this at all, and the true value was not in his success but rather in his willingness to even try. You see I think those who try, whether or not they succeed, inspire the rest of us. They show us that the value is in the try, not in the success of such a choice. They show us that on occasion you will not succeed - just as we all discover in this life. And if you build your life's evaluation on whether you succeed or fail then you may find yourself feeling rather dismayed because we all have experiences where "success" eludes us - but that is only if you assume success means reaching some arbitrary end goal. What if true success is something else? What if success is actually about the decision to try at all? Aside from the statement about Yoda I heard another statement recently that I found deeply profound. I was interviewing someone about what he does, and he said "Do not chase success - chase excellence, and you will find success". I was startled by the simple beauty and truth of that comment. We spend so much time seeking success, wanting to "do" instead of "do not", worrying that the "try" is not enough - and maybe it is in the "try" that we find excellence. Maybe our personal excellence will not find us at the finish line, and maybe it will not carry us through to gold medals or championships. But maybe, just maybe, we should focus less on the success or the perceived "failure" and focus more on the try, and what that trying means to others who may be on the fence about trying at all simply because they fear a world of "do or do not". So, there it is. Yoda was, quite simply, wrong. There is a try, and perhaps the real success and beauty of life is found in the try. Perhaps that is where we find real courage, and real heroism. In a world of black and white, "do or do not", I prefer a world where there is plenty of room for the try, and for the outcome of that try, whatever it happens to be. In this little community under the vast northern sky we have seen some heroes recently, and their heroism came not not from "do or do not" but rather from their courage in being willing to try. They are individuals who encourage the rest of us to put aside our notions of what constitutes success and failure and instead just do what really matters - and get out there, and try.